Since 2013, the International Livestock Research Institute (ILRI) has been partnering with the SNV Netherlands Development Organisation and the Kenya Livestock Marketing Council (KLMC) to implement an EU-funded project under the Kenya Rural Development Program (KRDP). The project on ‘Enhanced community resilience to drought through innovative market based systems approaches’ responds to concerns over the capacities of pastoralists to manage current and future climate risk as well as the sustainability of livestock production in the Kenyan Arid and Semi-arid Lands (ASALs). Led by Polly Ericksen, ILRI is responsible for evidence based knowledge development and dissemination to stakeholders and other communities, through documentation of evidence based best practices in the different interventions by the project. This is intended to result to a strong ASAL-specific knowledge base offering replicable strategies for climate change adaptation and market orientation. 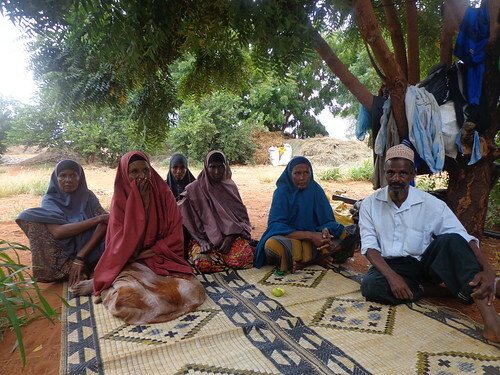 On 10-13 March 2014, members of the project team were in Wajir County to document best practice on fodder production as well as get an insight on the challenges and constraints faced by the pastoralists on fodder management. Wajir County located in the North Eastern part of Kenya, lies within the Sahelian climatic region, which is characterized by long dry spells and short rainy seasons. According to the Commission for Revenue Allocation in Kenya, Wajir ranked number 5 among the top poorest counties in the country in 2013. The team visited the ‘Muungano Makaror farming group’ in Wajir East, which was established in 2004 and has ten members (six women and four men). As we approach the Muungano group’s farm, we are awestruck by its lushness compared to the neighbourhood, not to mention that the farm is in the most arid part of the country. Not only does the group engage in fodder production, they also produce different types of fruits including pawpaw, bananas and citrus, as well as keep small ruminants on their farm. The group has managed through irrigation (they have a well on the farm) to produce large amounts of fodder to satisfy the demand of their stock of goats which consumes three bales per day and surplus for sale. In the last season, the group planted fodder on their six-acre land and produced more than 400 bales of fodder, out which they have managed to sell 35 bales. In addition, they have also sold five goats out of the 50 that they keep. The group has attributed their success in fodder production to the project which supplied them with inputs including fodder seeds, and offered them training on fodder production baling for sale. The group acknowledges that without the intervention of the project, they would not have engaged in fodder production due to the many constraints they face including lack of skills and access to inputs such as seeds and most importantly water. Out of the counties in which the intervention on fodder production is being implemented, the Muungano group has displayed tremendous success, and is a good example of how knowledge plays a role in managing drought. Before the project, the group engaged in fodder production but only at a very small-scale level and they did not have the necessary skills to upscale this and view it as a different source of income. The group is very enthusiastic about fodder production as a business, despite a major challenge they face in marketing of the fodder. Even though they have only managed to sell 8% of what they harvested during the dry season, they have already planted in readiness for the next season. For sustainability of the intervention and improved livelihoods, there is need for fodder value chain development in the county, so as to facilitate market access and success for the group. Tags: climate change adaptation, Drought, fodder production, Wajir. Bookmark the permalink.